In case you needed further evidence that the male humpback meatball's olive-sized brain stalls at an early stage of culinary development, well, here you go then. This is stale bread. And hot water. They tackle more challenging recipes than this in The Joint (I am told). "Bean bread" is what my family calls this dish. And that about covers it. Cousin John tells me that our grandfather was a big fan and that he regularly allocated vast sums of "Italian bread" to be used strictly for its use. Making a good bean bread doesn't exactly require a PhD (sorry, grandpa). First you take your stale bread or your frizelle or whatever similarly crunchy substance you find appealing and you slap it on a plate. Those beans you were boiling? What's that, you weren't boiling a pot of beans? Better get on that. Because after they're cooked you need to grab yourself a ladle, scoop out some of the cloudy-looking liquid that the beans were cooked in and then distribute it over the bread. Am I going too fast for you? I know. It's complicated. Trust me, you'll do fine. Next time you whip up a batch of beans, like for a soup or pasta e fagioli, give my grandpa's bean bread a try. It's as delicious and comforting as it is simple to prepare. Any meatball can do it. It's a beautiful thing, right? 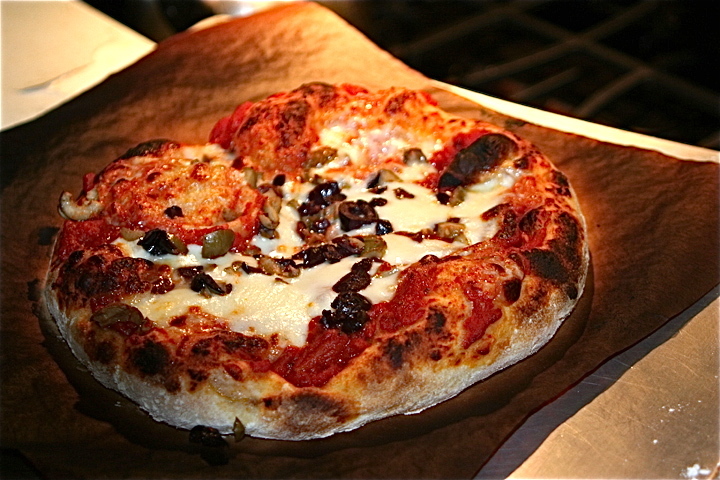 A homemade pizza, baked in a standard gas oven. I don't know about you, but this is the first such specimen I have ever seen that looks quite like this. The dough recipe is from Jim Lahey's new book, "My Pizza: The Easy No-Knead Way to Make Spectacular Pizza at Home." Lahey is revered in his circle and for good reason. 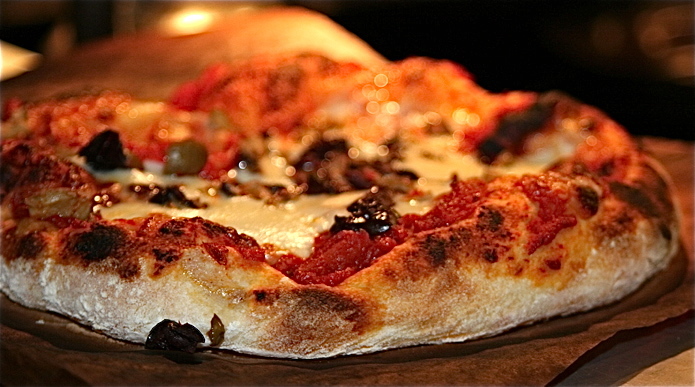 His Sullivan Street Bakery and Co. pizzeria in Manhattan produce some of the finest breads and pizzas you will ever lay hands on. And so when Mister Meatball's in-house pizzaioli Tom and Beth spied Lahey's recipe in the March 2012 issue of Bon Appetit, it didn't take long for them to get to work. 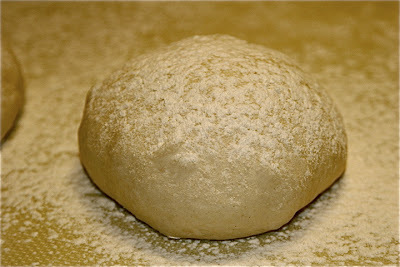 The full recipe is below, but here's how it starts: with a dough that rises for around 18 hours. Lahey's recipe makes a lot of pizza, six of them actually. And so the batch needs to be carefully divided and handled. Look at those beautiful bubbles. I've never seen a homemade pizza dough act quite this way before. What can I say? My head's still spinning. Tom and Beth insist that they will never again use another recipe. And that's good enough for me. Here's the link to the Bon Appetit piece about Lahey's dough, but I've also reprinted the recipe here. It's worth trying. Trust me on this one. Please. A storm passed through town a couple weeks back, and a lot of people scored themselves a snow day. On a late-morning drop in at my Facebook page I noticed a Friend trolling for comfort food ideas. It appeared she had made up her mind to lounge in pajamas all day while the rest of us shoveled snow and checked in on elderly neighbors and hunted and gathered to sustain humankind under desperate conditions. Anyhow, I kept the attitude to myself and gave the woman what she was after. "Since I know you keep red sauce around at all times (right? ), well then you heat some of it up, crack a couple eggs on top, let 'em poach real nice, then throw 'em on top of some nice toasted bread from the baker of your choosing," I advised. "'Course, there's always Cocoa Puffs," I felt obliged to add. "Like, as a Plan B." Some time later the lazy lassie (I'm thinking those jammies with the feet attached, am I right?) managed to summon enough energy to respond. "Meatball, you're a genius," she wrote. "I have all of that stuffs." I have no idea whether she ever made use of "that stuffs," but I did only yesterday. I am not a genius, by the way. People have been poaching eggs in tomato sauce and laying them over a nice crusty bread forever. I don't think to do it myself very often, but whenever I do, well, it doesn't get a lot more comfortable around here than that. The only thing I did differently this time was to use these homemade biscuits, which to certain people might make the dish even more appealing. But then I also shovel snow. And help old people when they need it. Like in a snowstorm. With all the fresh pasta making that goes on around here, you'd think that at some point I'd have gotten around to using duck eggs. I've thought about it enough, but the eggs just aren't that easy to find. I like duck eggs. A lot of people don't because they have a much stronger flavor than hen eggs, but that's actually the thing I enjoy most about them. Duck eggs really taste like something? Anyway, I scored a dozen of the eggs at the winter farmers' market here in town on Saturday morning. Right after lunch (potatoes and duck eggs, of course), I set about to my work. Doctor Bill at the Lipitorium would not approve, what with these having twice the cholesterol of hens' eggs, but just look at these things, would you. Fresh-off-the-farm eggs are always richer in color (and taste) than store bought, but duck eggs are in a class by themselves. The yolks aren't only huge, they're more strongly flavored than hen egg yolks. It really is impossible not to notice the difference, I think. I've made a lot of egg-based pasta, but the color here is the brightest I've seen. Here's the dough that I wound up with. It really came together very well. I decided to go with a thick spaghetti and so out came my trusted chitarra. This is a very delicate tomato sauce. The flavor of the pasta itself really came through. I liked it a lot, in fact, and will definitely add the duck eggs to my routine. If you're a pasta maker, and can get your hands on the eggs, I strongly suggest giving this a try. 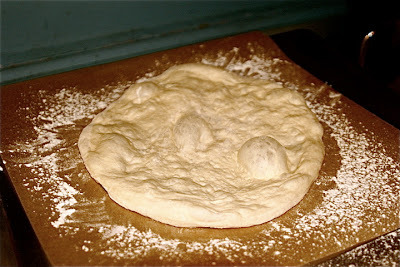 Pour the flour onto a work surface and, with your fingers or a fork, create a well in the center. Crack the eggs and place them in the well, then add the oil and the salt and mix as if making scrambled eggs. Slowly incorporate the flour into the egg mixture until a dough forms (I use a pastry cutter to turn over the mixture a couple times when it becomes dough-like). 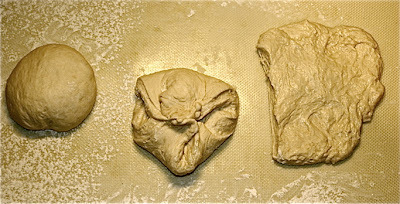 Knead until the dough is well formed, adding flour as needed. Place the dough ball in a plastic bag and leave it in the fridge overnight. 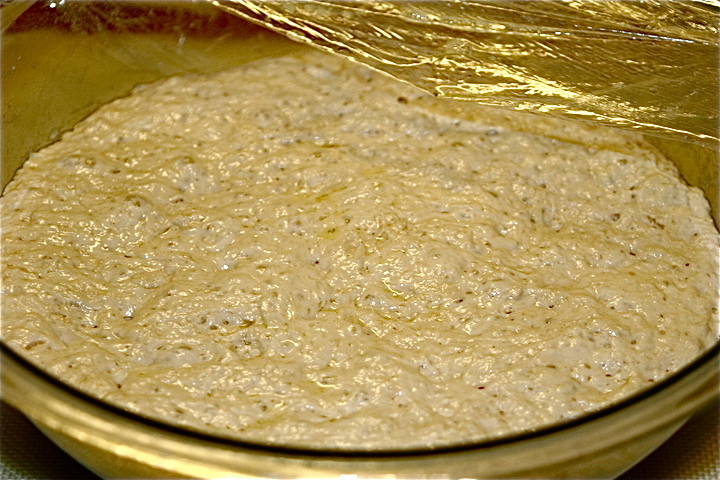 Before using make sure to bring the dough up to room temperature. It's also okay to use the dough the same day you make it. But let it rest (covered) at least a couple hours at room temperature before rolling it out. I was a breath away from posting two vegetarian dishes in a row when out of nowhere appeared a bunch of really nice sweet Italian sausages. They came from a local butcher here in town, a gift from an acquaintance who on occasion swings by the house, well, unannounced. This person's timing is impeccable. Never does he/she arrive so close to dinner time that I cannot find a way to incorporate the item or items inside of the bag that arrives with them. Once it was an entire pork roast, another six different kinds of shellfish; on one particularly memorable occasion it was an 11-pound fresh turkey. And so you could see why a mere couple pounds of sweet sausage didn't rattle me. A day earlier I had decided to alter a recipe which (coincidentally) called for sausage as a main ingredient. The recipe, Strozzapreti with Sausage, Grapes and Red Wine, was from Carmellini's "Urban Italian." I didn't have strozzapreti on hand but did have a really nice matriciani to use in its place. I was also about to substitute walnuts for the sausage (go ahead Kitty; you too Mavis and Little Glodes), but then of course my visitor showed up. This recipe (reprinted in its entirety below) requires that you plan a day ahead, eight hours actually. The grapes need to be sliced and mixed with sugar, vinegar and wine. Then they need to macerate overnight in the fridge. Boil the mixture until the liquid reduces by around half. While this is happening you're also sauteing the sausage meat in another pan, as well as boiling your pasta. Add the grapes to the sausage. And then add the pasta, mix thoroughly, and serve. I still think the walnuts would be a nice substitution. Next time I won't answer the doorbell. And hope my acquaintance just goes away. 1. Combine the grapes, wine, sugar, and vinegar in an airtight container and store in the fridge at least 8 hours. 2. Put a large pot of salted water on to boil for the pasta. 3. In a medium saucepot, bring the grape mixture to a boil over high heat. Cook until the liquid has reduced by half, about 10 minutes, then remove from heat. 4. Cook the pasta until al dente. 5. Remove sausage meat from casings, heat olive oil in a pan and add the meat; cook until browned, about 5 minutes. 6. Add the onion and continue cooking, stirring well, until sausage is well browned and onions have softened, 5 to 7 minutes. Add the sage leaves and stir to combine. 7. Add the grape mixture and stir well. 8. Add the cooked pasta and mix thoroughly. Remove from heat, add the butter, cheese and black pepper, stirring well. Add the parsley and serve immediately, topped with additional cheese.